Damascus (AFP) - Syrian troops seized control Monday of a village near the strategic rebel bastion of Yabrud as they pushed closer to the town near the border with Lebanon, state television said. The Syrian Observatory for Human Rights monitoring group, meanwhile, said the army, backed by Lebanon's Shiite Hezbollah, was "advancing" in the area, but that "fierce battles are still ongoing there." 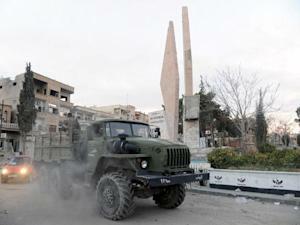 Al-Qaeda's Syria affiliate, Al-Nusra Front, is playing a major role in the fighting, said the Britain-based Observatory. State television said the army "took control of Sahel village in the Yabrud area, after killing several terrorists." Sahel is only six kilometres (four miles) from Yabrud, a key rebel stronghold in the Qalamoun mountains, north of Damascus, and near the Lebanese border.